Hi, I’m Karen Teal and I have been an Art and Textiles teacher for 33 years. 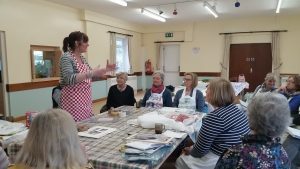 I am passionate about all forms of art and textiles and about working with learners young and old to develop skills, concepts, understanding, creativity and confidence. I come from North Wales originally but I’ve lived and taught art and textiles in China for 4 years and Switzerland for two years before returning home to Wales and a move to Resolven in August 2018. to join my partner Simon Pierce.. 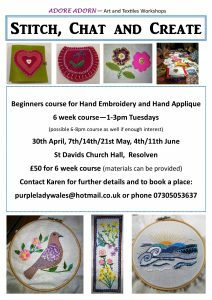 I hold workshops for small or large groups and I’m holding workshops locally in Glynneath, Bridgend, galleries in Swansea and Neath as well as one open to all in Resolven. Along with practical workshops I give talks to groups on my trips to Asia and the textiles that abound in those areas. 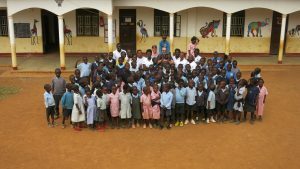 I also continue to volunteer at a school in Uganda and can give an interesting insight into the life of the people there, volunteering and supporting staff and students in a small village school in Nabugabo.